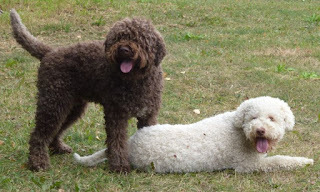 The appearance of the Lagotto can vary, and generally have floppy ears, and large round eyes in any shade color ranging from golden to a dark brown. Their water friendly coat is very thick and curly. Solid colors include off-white, golden, or brown. They can also be found white with brown or orange patches or roan. 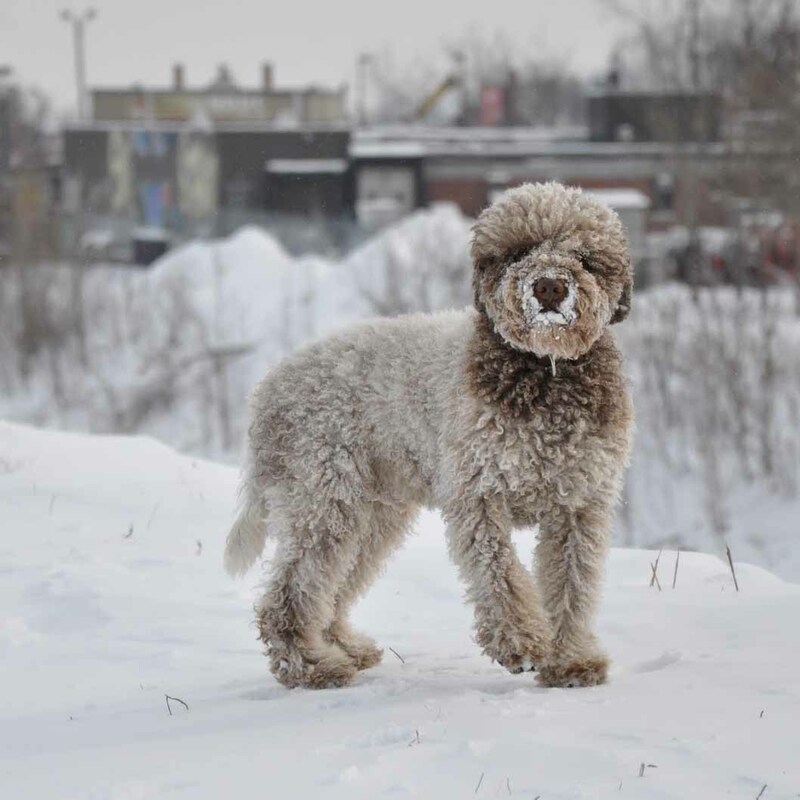 It is a medium to large sized dog that is hypoallergenic, which also means it almost never sheds. A Lagotto often displays white markings that grow out in adult status. The Lagotto is made to work. They generally have sharp senses, though their eyesight is more sensitive to motion than detail. They are very loyal and loving, making them the perfect family companion. Some are easy to train, and many get along with other animals quite easily if they're socialized as puppies. Some Lagotti are excellent swimmers, but some will only paddle. Some will retrieve from lakes, streams and other bodies of water without hesitation. They are lovable family pets and tend to like attention. Lagotti love to dig; many owners give them a sandbox, or have a designated place to allow them satisfy their digging urges. They also love to play seeking games and have very active, and clever minds. 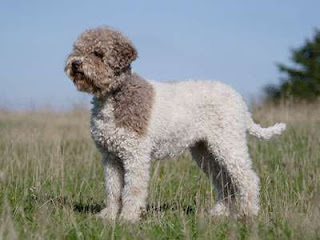 It's thought the Lagotto Romagnolo has been around for centuries having been bred in Italy as a water dog and retriever. 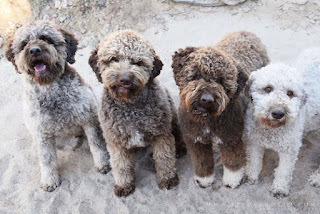 The breed has been well-documented throughout history with paintings depicting similar looking, handsome dogs dating as far back as the 1400's. As such, the Lagotto is considered to be one of the most ancient breeds with many other more recent water dog breeds being descendants of the Lagotto. The Lagotto Romagnolo was recognised as a breed in its own right by the Italian Kennel Club in 1991 and their popularity elsewhere in the world has led to more breeders producing good examples of the Lagotto in many countries which includes here in the UK. 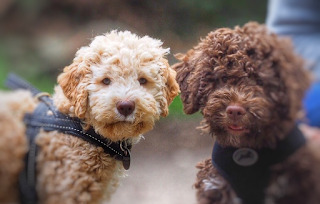 However, very few puppies are bred and registered with The Kennel Club every year which means that anyone who wants to share their home with a Lagotto would need to register their interest with breeders and agree to being put on a waiting list. Althougth the Lagotto is first and foremost a working dog, they do make wonderful family pets as long as they are given the right amount of daily exercise and mental stimulation to keep them busy and happy both physically and mentally. They are known to be exceptionally good natured around children and love nothing more than to be part of a family. They are best suited to people who lead active, outdoor lives and who would like to have an energetic, intelligent canine companion at their side. They are not the best choice for first time owners because they need to be handled and trained by people who are familiar with this type of dog’s specific needs. 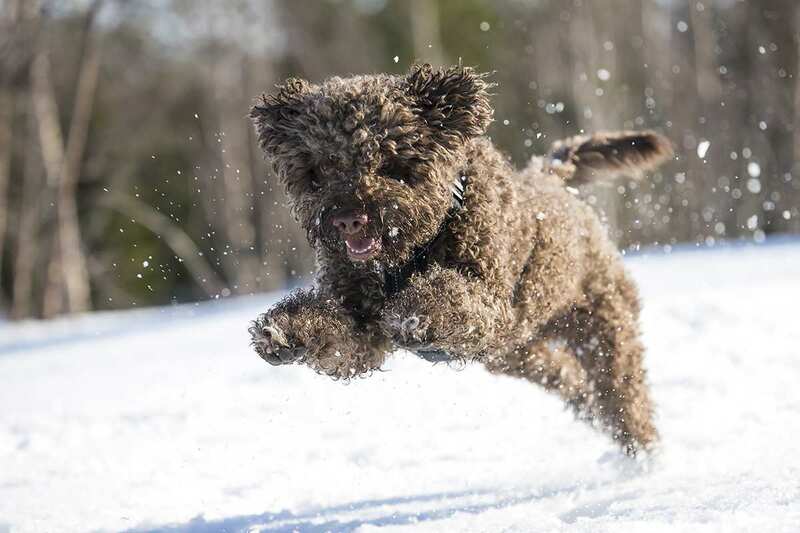 The Lagotto does boast having quite a high prey drive having extremely good hearing as well as a very keen sense of smell. They can also spot their prey in the distance which means that when they are being trained, particular attention has to be paid to the "recall" command right from the word go. They love being in and around water which means care has to be taken as to where and when they are allowed to run off their leads just in case a dog decides to jump in any of the more dangerous water courses. 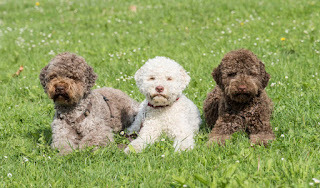 They also love to dig which can become a problem if dogs are allowed to roam around a garden which often sees a Lagotto happily digging up flower beds and lawns. Lagottos are a generally healthy breed and do not suffer from any major hereditary health issues. Some breeding lines are known to have problems with hip dysplasia and epilepsy. Lagottos are born to work hard and require rigorous, daily exercise. They make excellent hiking and jogging partners. Lagottos also love to swim and often take to the water naturally given the opportunity. It is also important to remember that as a working breed, Lagottos require a “meaningful” and mentally stimulating task that they can engage in each day to live happy and fulfilled lives. This can be something as simple as a game of fetch or a session of hide and seek. There are conflicting ideas on how to groom this breed. Some say they should be brushed regularly and others believe their coat should be allowed to grow to a naturally fluffy coat. The lagotti coat gets matted easily, and the mats should be carefully pulled apart without tearing the coat. It is recommended that the coat be cut down at least once every year. If the coat is kept trimmed to approximately 1.5 inches all over the body and slightly longer on the head, it will be easier to maintain. Hair on the ears should be trimmed around the edges to the leather. If the ears show irritation or buildup of dirt and earwax, the hairs from the ear canal should be gently plucked out regularly. Some coats matt more easily than others. If left untended, Lagotti hair will grow to cover the eyes, meaning the hair around their eyes should be clipped periodically to ensure that they can see. 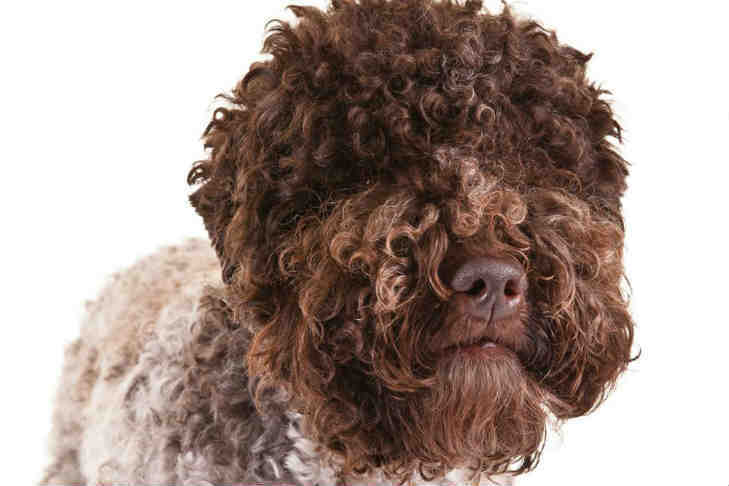 Is the Lagotto Romagnolo the Right Breed for you? Easy Training: The Lagotto Romagnolo is known to listen to commands and obey its owner. Expect fewer repetitions when training this breed.